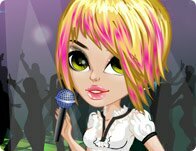 Description: There's a big party this weekend and this cute girl is going to need a brand new look so that she can attend the party looking cute and stylish. As a professional stylist, she has hired you to help her choose clothes, accessories, and new hairstyles. Choose wisely as your reputation will be on the line here, many people will be expecting her to arrive looking absolutely stunning.